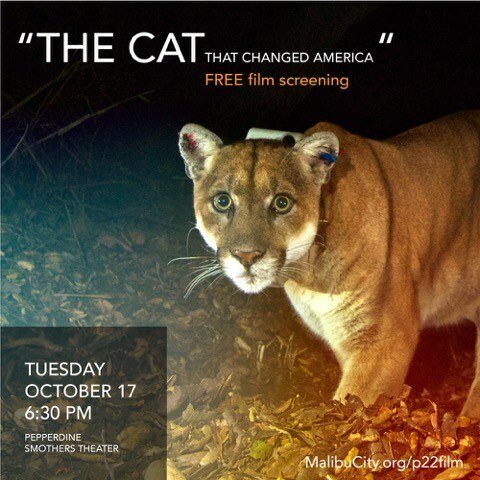 The Cat that Changed America is a documentary featuring P-22, the mountain lion who crossed two Los Angeles freeways, and now resides in Griffith Park. The film explores how humans in urban areas co-exist with wildlife. Click here to make a reservation for this free showing. This is the “official” Malibu showing, co-sponsored by Pepperdine, the City of Malibu, and Poison Free Malibu. Rhiannon Bailard, founding Director of Pepperdine’s Center for Sustainability will be the emcee. Mayor Skylar Peak will give opening remarks. Please bring family and friends to see this inspiring documentary. A reception with light refreshments and food will begin at 6:30 pm prior to the 7 pm screening.